When NASA first started sending astronauts into space, they realized that the ball-point pen would not work at zero gravity. This anecdote was mentioned in the episode We killed Yamamoto of The West Wing as well as many emails. Originally, NASA astronauts, like the Soviet cosmonauts, used pencils, according to NASA historians. In fact, NASA ordered 34 mechanical pencils from Houston's Tycam Engineering Manufacturing, Inc., in 1965. They paid $4,382.50 or $128.89 per pencil. 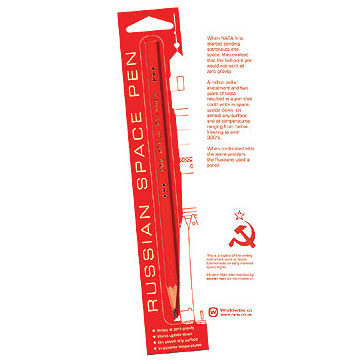 Since the late 1960s American astronauts and Russian cosmonauts have used Fisher's pens. In fact, Fisher has created a whole line of space pens. A newer pen, called the Shuttle Pen, was used on NASA's space shuttles and on the Russian space station, Mir. Not the answer you're looking for? Browse other questions tagged history united-states russia nasa . Did NASA receive a tax refund on a diamond window when it left the Earth aboard a space probe? Did NASA refuse to pay a $400 fine for littering caused by the deorbiting of Skylab? Did NASA use CGI for the Apollo mission trainers?